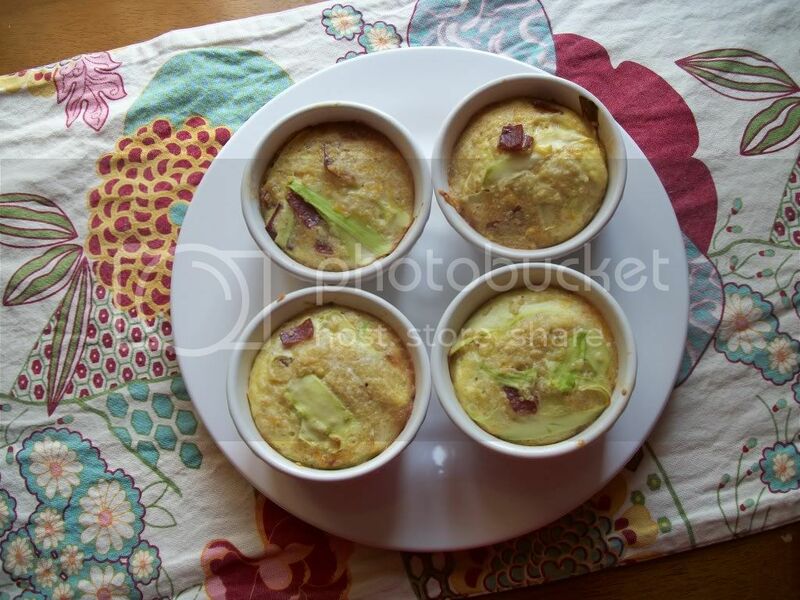 I came across this recipe a few weeks ago from Iowa Girl Eats for Ham & Cheese Quinoa Cups. I have never cooked with Quinoa before and had been wanting to try it for a while. Quinoa is a grain that is like little seeds that after cooked puff up into a somewhat rice like consistency. It is a great healthy option to pasta or rice because it contains many essential amino acids, calcium, phosphorus, and iron - and it's gluten free! So back to the recipe. These cups are kind of like little mini frittatas in single serving ramekins. I modified IGE's recipe slightly. I used turkey bacon instead of ham, and I decreased the recipe slightly. I ended up with 4 single servings (she made her's in mini muffin cups for a bite-sized version), although I ended up eating 2 because I was going to be working out in a few hours and didn't want to be hungry. If you are making other items for brunch I think one cup would be enough, but if you are just eating this for breakfast or brunch, you might want two (or find bigger ramekins!). This was so very tastey and adding the Quinoa to the eggs helped to make it a more fulfilling meal. I think it would be great for breakfast, lunch or dinner...and especially good for brunch! First make quinoa based on package directions. Then combine all ingredients in a large bowl and mix together. Liberally spray ramekins with non-stick spray and spoon mixture to the top of each cup (they won't puff up too much so you can leave only about 1/4 of an inch at the top). Bake for 15-20 minutes, or until the edges of the cups are golden brown. Let cool for at least 5 minutes and enjoy! Sounds tasty! I haven't tried quinoa yet, either. Been wanting to try quinoa too because I read where it is so healthy. Did it taste as good as you thought?